'Clayton', originally the Stephen Lloyd Bryce estate designed by Ogden Codman Jr. c. 1901 in Roslyn and later owned by Childs Frick. Click HERE and HERE for more on 'Clayton'. Does anyone know the current status of the new building mentioned in the 2009 comments? I haven't been there in over a year but I don't know what new building they were referring to (don't recall anything). And the house was not in any recent danger of demolition...it has been the Museum of Art for as long as I can remember. I wonder when & who made the decision to expand the porch & balcony to run across the entire span between the wings. Did they want the front of the house to more closely resemble the back? Ogden Codman Jr. was one of my favorite architects. I've never thought 'Clayton' was one of his best works & yet it is one of the few that has survived ... but at least we have it. I was recently there for the Avedon exhibit, and took a long walk through the grounds and I didn't notice any new building. 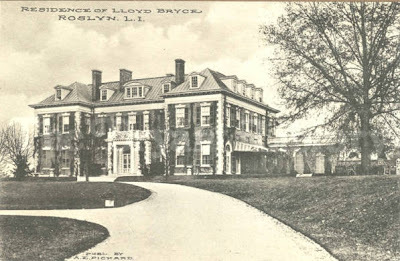 Doug, the porch was added when Childs Frick bought the estate. If memory serves me correctly, the designer was Sir Frederick Allom, who also re-did the interiors to a more Frick-like standard. Codman was very fond of the end pavilion/recessed center composition, and knocked it off a number of times, in both Georgian and 18th century French version. Personally, I find him mostly better with interiors, and his exteriors are always a bit crowded in composition, and flat. I wish they'd find the funding to repair that amazing plasterwork in the room directly behind the main hall fireplace.